Each year we invite the young and the young at heart to An afternoon of Fairytales. This annual event is a family- friendly event that raises awareness to empower women and women with children to begin their journey to healthy independent living. Together we can give everyone a voice! Proceeds from this event benefit the Restoration Village advocacy program. Advocacy is the cornerstone for helping residents connect with the resources they need to continue on their journey to success. You can be a hero in our community. Join us in strengthening women and children so they may enjoy their own fairytale happy ending. 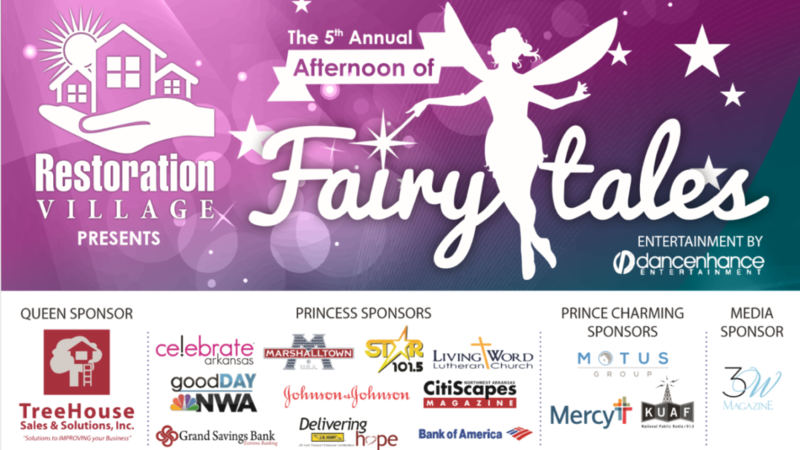 We invite the young and the young at heart to support our 6th Annual Afternoon of Fairytales. Come dressed as your favorite prince, princess, fairytale character, or super hero/woman! Tickets: Children $10 & Adults $5. On Saturday, Feb 2, prices increase to $12 for Children & $7 for Adults. Buy three children’s tickets and receive the fourth one free. TICKETS ARE AVAILABLE HERE. Tickets can also be purchased at the door. Visit us on Facebook to see photos from the event and to share your own favorites! Don’t forget to add a comment and tag yourself! We would like to thank the following event sponsors!